A second modeler's treasure trove of NYC rolling stock information with expert commentary by NYCSHS members Len Kilian, Jim Odell, and Jeff English. 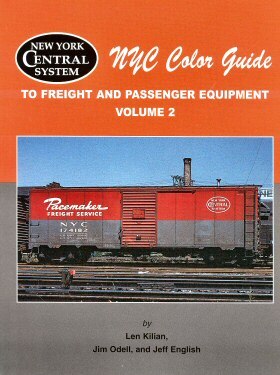 A second all color book devoted to the New York Central’s rolling equipment after WWII, when color film was available for public consumption. This sampling comes from different collections (than volume one), and features a slightly better print job. Your shop-keeper does not know why the images are a bit clearer than volume one – better scanning, more modern printing equipment, better photographers,… take your pick. Most of these images were shot “on-line”, so perhaps, with more NYC equipment in the vicinity, the photographers had cleaner equipment and better sun angles to choose from. At any rate, this is another modeler’s treasure trove, with more expert commentary for the historian in all of us.